Hello and happy Friday! This is a super fun and exciting one for me- I am currently back in MISSOURI!!! I’m going on a fun girls camping weekend at the lake and it will be GREAT! I have been looking forward to this since… well since I got home from the same trip last year. It’s always a blast to see my college buddies again, catch up, hang out in the water, and just have fun girl time! There should be 8 of us this year and I can’t wait to get the weekend started! Here is what has been on my radar this week- enjoy! 3. Fed Up. This documentary takes a serious look at the sugar problem in America and was a very informative and good watch. It had a lot of good things that really made me think…. so please don’t judge me for having 2 batches of rice krispie treats in my bag right now. They’re for everyone to share this weekend, so that makes it better… right? 4. To really solidify my spinster status (since I am allergic to cats) I bought a puzzle! It is adorable and I have enjoyed working on it a little bit at night when I get home from work! 5. 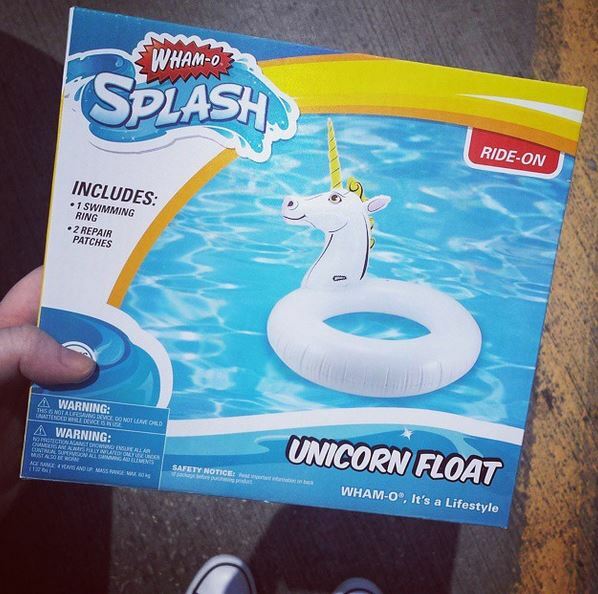 I went to the store Five Below for the first time the other day and they have the BEST pool floaties! They have mats, tubes, a pretzel, a popsicle, a donut, a unicorn, and more! I got the unicorn, and now my weekend at the like will be 1000x more magical. Wham-o. « My New Favorite Place and a $3 Lunch!